I have been struggling to get my tarte tatins looking good on the plate. They taste fabulous but turning them out for serving is a challenge. I’m not fanatical about presentation but I don’t like it when things look messy. Good cooks can improvise if they haven’t got the right equipment but I couldn’t resist buying a proper tarte tatin pan and plate at Moore Wilsons last week. I was a bit nervous the first time I used it because it doesn’t look like the kind of cookware you can put on a naked flame. 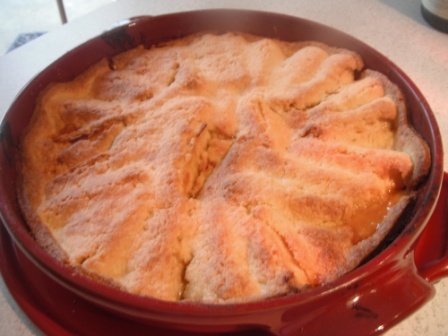 That nervousness meant I had the heat too low and the apples stewed rather than caramelized in the butter and sugar. The pastry was crisp and light though. It still fell apart when I turned it onto the plate. Next time I might smear butter around the edge of the plan before putting pastry lid on. Use a cast iron frypan – works really well. Yours looks very tasty though! Can you please send one to 136 Albany St. Thanks.